The 16' long x 8' wide floating dock c/w 6 floats that bolt onto the bottom of the frame, into a threaded channel in the extrusion. Floating docks allows you to have a docking system in water that is too deep for a dock on legs, or in situations where water (depth) fluctuations are frequent/extreme. Achieve the ultimate in shoreline enjoyment with this 4 ft. x 16 ft. Patriot modular aluminum marine dock with Cedar Decking. The 12-inch deep aluminum truss frame is expertly crafted with welded and bolted connections. 7/16-inch Dia aluminum chord rods are thicker and stronger than most. The dock pipe is all 1 1/2 schedule 40 electro-galvanized steel, not lighter weight steel tubing. The pipe brackets are extra long with two - not one - stainless steel set bolts. Patriot Docks have a limited Lifetime Warranty on aluminum frame and poly and aluminum decking. 16 ft. 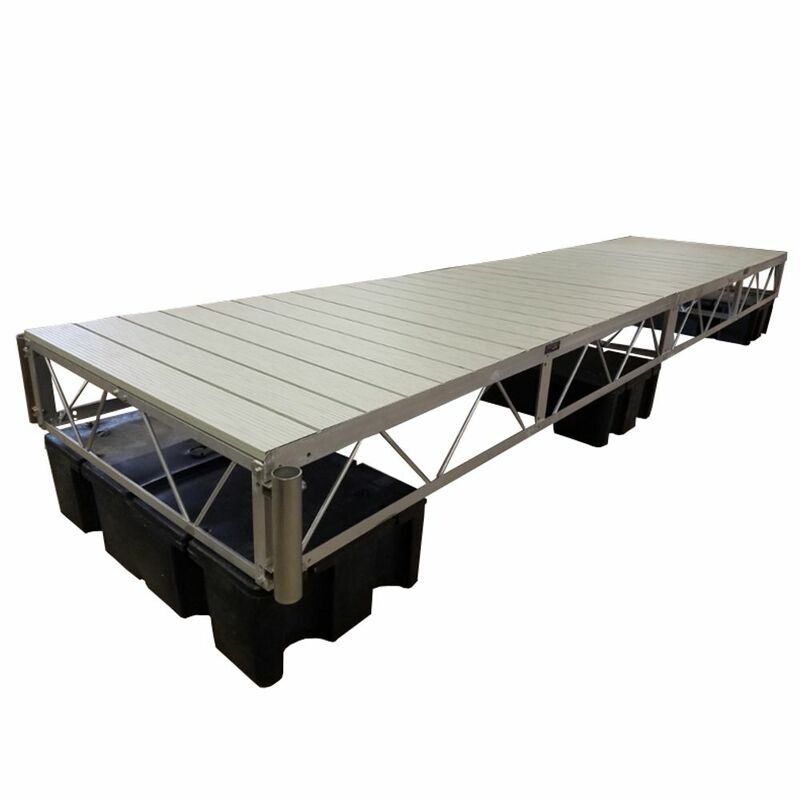 Floating Dock with Gray Aluminum Decking Patriot Docks floating dock structures are excellent for deep or fluctuating water levels and soft lake bottoms.Three 12 inch polyethylene rectangular floats are recommended per 16 ft. of dock frame. Add multiple floating structures together to achieve desired size and configuration. Use the universal Floating Hinge Kit (PN# 10845) to secure the floating dock structure to a stationary pier or between longer floating sections. Includes 2 inch i.d post brackets designed to accept 1-1/2 inch i.d piling post or to be used for anchor point.